***Update: 9/6/2010: The amazing 67% off Shutterfly 8×8 hardcover Groupon is available today (9/6) and tomorrow (9/7) in many major U.S. cities! 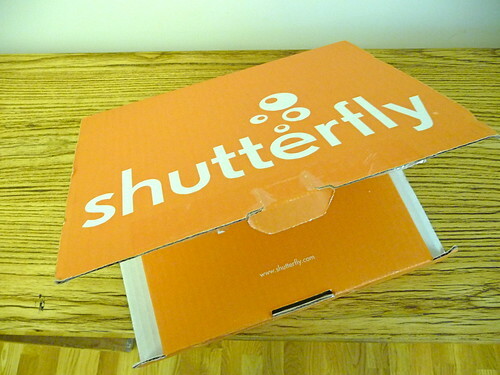 Shutterfly, as with many other companies, understands the power of a free sample. It’s like those food samples at the grocery store – you taste a little yummy morsel and you can’t resist buying a whole box of cookies. Around the same time as this 5×7 promo, I happened to get an e-mail for a Father’s Day promotion for a free 20-page 8×8 photobook. 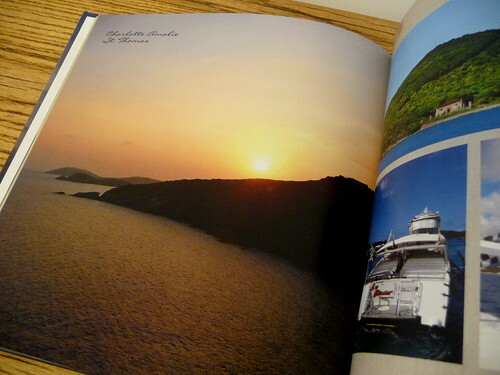 (Don’t tell Dad that I used “his” book for something else – a book of our cruise that we took last fall for my husband’s birthday.) My book turned out to be 39 pages, so I just paid for the 19 additional pages. Luckily there was a 20% off sale, so I got the pages at $.80/page instead of $1.00/page. Since I reviewed Shutterfly’s software in the previous post, this post will be a review on Shutterfly’s 8×8 hardcover book itself. This hardcover book feels solidly constructed. As with other case bound books, the pages are glued and attached to its hardcover case. 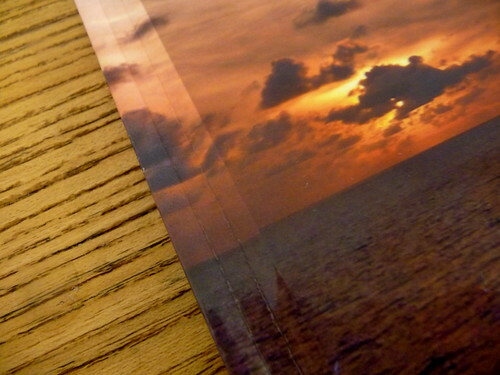 The cover is glossy and you can customize the front, back and spine with custom photos. 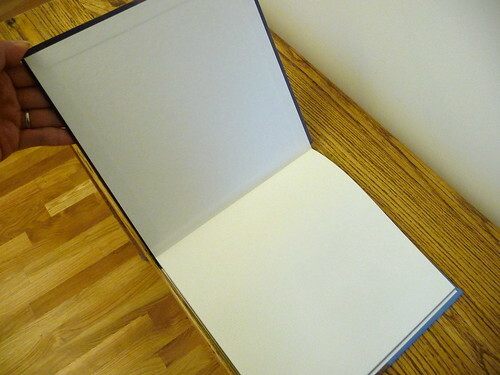 A white waffle-textured cover page is the first page in the book. I like it when hardcover books contain these cover pages – it adds a nice finishing touch that gives the book more polish. The interior pages are 100 lb. gloss coated, acid-free text weight paper and appears to be the same interior paper used for their softcover photobooks. As with my other Shutterfly photo book, I should have turned off the VividPics function – Shutterfly’s auto color enhancement tool. My photos printed redder than what I saw on the screen. That actually was an unexpected a side benefit for my sunset photos, but not for photos of our faces. The photos as a whole still came out fine, but in a few photos where our faces were already on the darker side, they came out even darker due to the reddish tint. Read my prior post to learn how to turn of VividPics. 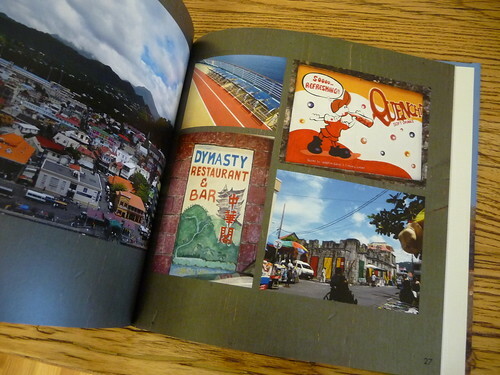 Note, it is very difficult for a digitally printed photo book to replicate what you see on your computer screen, as your monitor often shows things brighter than what prints out. Some folks increase overall brightness and saturation on their photos to more closely match what they see on their computer screens, but that’s just a best guess. Some companies offer monitor profiles that you can use to calibrate your monitor to adjust the brightness and color of your screen to match the printer’s output. When you find a photo book company that suits you, it will be well worth the effort to calibrate your monitor to that company’s printer profile. Regardless of the color shift, the overall print quality was very good and the photos were sharp and vibrant. I still wish there were an option to turn off page numbering though! You can choose your own image for the spine, but you can’t title the spine as with some hardcover books. (Update: You can now title the spine!) 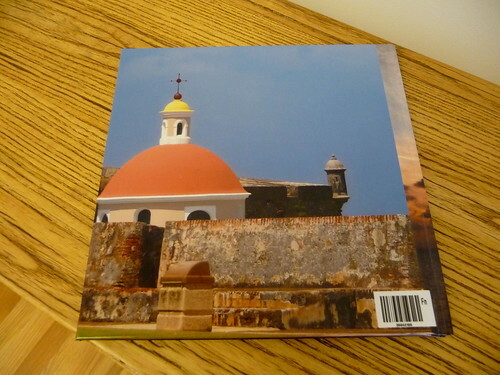 This image can be different than either image on the front or back cover. I tried to line up the spine with the front image and came really close to getting right, but the alignment is slightly off and the colors don’t exactly match. Next time, I’ll probably either choose a complementary or neutral background color like black, or choose a completely different photo for the spine that can stand on its own. It’s too hard to line up the spine exactly and it doesn’t match the back photo anyway. 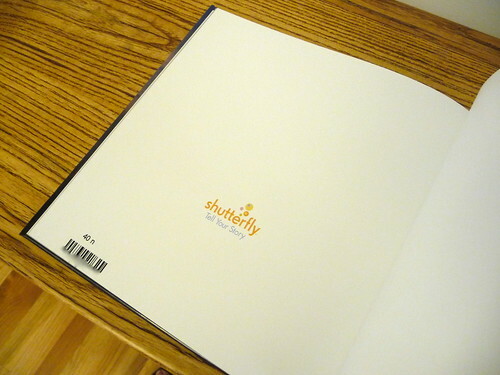 The Shutterfly logo and bar code is printed on the last printed page of the book. Another bar code also appears on the back cover. One of the hardest things I find in making photo books, is getting proportion and font sizing right. Oftentimes, our computer screens are not big enough for us to tell whether a caption or title is sized appropriately for readability and proportionally. Shutterfly defaults its 8×8 book font size for interior pages to 14-point font and its 12×12 default font size to 16-point font. In this book, I used very little captioning. For the most part my captions list the place where the photos were taken and then I allow the photos to speak for themselves. If you’re interested in the sizes I used, my captions are 20th Century font at a 12-point size. The captions were very readable at 12-point size and I think they would have been too large in a 14-point size for my taste. For the cover and title pages, I used Liorah font. The cover is at 20-point size and interior title pages are at 14-point font. 3) Remember that font sizes vary from font to font and printer to printer. A 12-point in one font doesn’t mean 12-point of another font will equal the same printed size. As mentioned in my earlier post, Shutterfly is a solid choice – with easy to navigate software and very good print quality and construction. For more information on Shutterfly check out my Shutterfly overview. Show me what types of photobooks Shutterfly offers. Take me to Shutterfly to make a photo book! Hi photobook girl. I love your blog!! Although I am not a professional photographer I, like you, have enjoyed photography for years. I recently received an e-mail with a coupon code for a free 8 x 8 hardcover photobook from shutterfly and just jumped on the chance!! This is my first project and I had so much fun making it! My book is due to arrive next week. I will let you know how it turns out. BTW in your review it says you can’t title the spine but I was able to title my book, I guess they changed that since you posted your review. P.S. I love the style you use for your books, very simple not loaded with a bunch of cheesiness from some awful background, letting your beautiful photographs speak for themselves. Thanks for posting your comment and I appreciate the compliment. I look forward to hearing about your book. I will look into that spine thing – thanks for letting me know! I received my book and wanted to let you know how it turned out. First of all their shipping is really fast!I ordered the book on Oct 19th and received it on Oct 25. I loved the front and back covers with the high gloss, however the pages inside were not as glossy as I expected them to be. The colors were pretty vibrant and well saturated, close to what I saw on the screen. No mistakes were made with printing or with the text I wrote and it’s official you can now title the spine! I’m pretty picky so I can always find something I didn’t like. 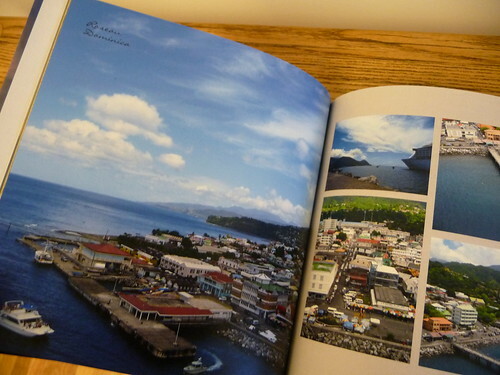 In this case I found the layouts where I used 5 or more pictures per page are definitely too small for this size book. You can barely see the pictures, this is my own fault since I had no experience before this book, I guess I just imagined it would be bigger. From now on, I’d probably stick with a maximum of four pictures per page in an 8×8 book. My other problem was with the print quality itself. Some pictures, especially the ones with our faces, seemed a little grainy to me (the originals weren’t). I used an 8 megapixel point and shoot so I don’t think the camera’s resolution was the problem. I don’t know what it was (the paper they use??) but our faces could have looked a little sharper. All in all though I was happy with it and it was free!! So I can’t complain. I will definitely be searching other companies to see if I find one with better printing quality. I’m curious to try MyPublisher, I’ve seen other posts where you mention you really like their print quality. Thanks for all the reviews they are really helpful. Thanks for your comment Gwen and no need to apologize for its length – it contained a lot of useful information and I’ll update the part about the spine on my next round of database updates! I love the food spread – haha! My husband and I are foodies and would totally have something like this. I wish I would have read this before I did my first Shutterfly photobook, pretty much my first online photobook ever but you live and learn. I’ll remember the VividPics thing, something I didn’t realize with my first photobook. Great review! I have made MANY Shutterfly Photobooks with great success. I use Photoshop to make all my pages then make my books with single photo full bleeds for absolute control and limitless options! Thanks so much for your comment about turning off the “vivid pics.” I never would have known about that and I saw your post just before sending in my first book with them which I was very happy with. Later I did a card and forgot to disable the “vivid pics” and did not like it! When photobookgirl speaks, we listen!! Thanks again! hahaha…thanks for the new motto Sharon! I’m waiting for a shutterfly photobook that I made for my mom with all the events leading up to and including my wedding. I don’t think I had the vivid-pics function on so we’ll see how the quality is. Your pictures looked great! 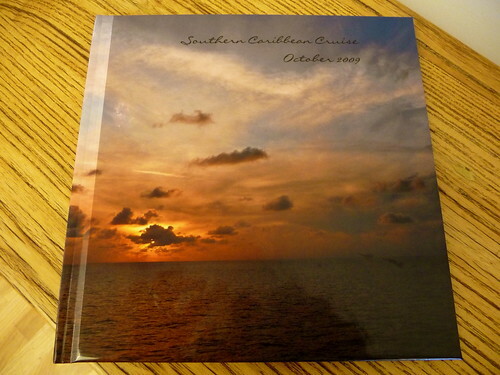 I have ordered from shutterfly before and love the service and the quality. I just recieved my 8×11 photobook from Shutterfly and it has turned out to be very good. The colors are so brilliant that I cant believe my camera did that!! (I have a Nikon D90). From the construction to the fonts to the pages, everything is just perfect. This will be the best birthday gift I will ever give to my wife 🙂 Cheers. I have a D90 too! Glad that you like your book. I’m sure your wife will love it, but beware she’ll probably want more! Thanks for coming back to post a comment to let us know her reaction! Yes, it definitely feels great to put work into something and have such a great response! My Mother’s Day book is going to be late too, but it’s safe to say she’ll love it in the end as well. My mom shows her books to all her friends and I know it makes her happy to have photos in hand as she is not a computer person. Happy birthday to your wife! I will never use shutterfly.com again. I had had a bad experience with ordering prints from shutterfly but I decided to go ahead and give them another shot since they are known for great photobooks and I had a coupon for a free 20 page 8×8 hardcover book (plus shipping of course). So I spent a day making book of my trip to the italian alps during christmas a couple of years ago. I was so disappointed with my overall experience. A few weeks ago I did two books on mixbook.com and loved all their options and their ability to 100% customize everything. 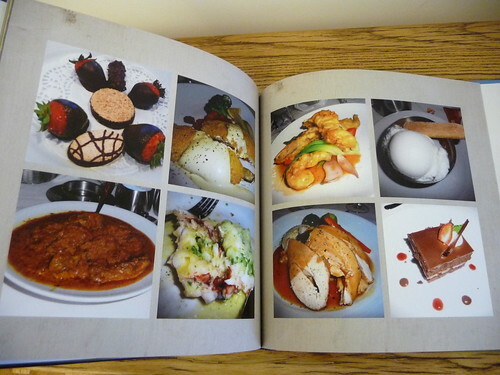 It drove me NUTS that it is so hard to even move a single picture on a page in shutterfly! I guess with the new custom path option you are allowed but you have to click on several things before you get there and you have to do that for each individual spread. Then there is no re-do or undo option! There is on the main page but that’s only for the stupid templates! Many of the pictures were mostly white because of all the snow with a beautiful view of the mountains. I decided (stupidly) to keep vividpics on because I though it might make it look better. Well boy was I wrong. I just got my book today and the pictures are SOOO dark its ridiculous. Not only that, they are SO fuzzy. I can almost forgive messing up color but not when you mess with sharpness too! I am shocked at how people have good experiences with shutterfly. This is my second bad one and I’m done. Especially since I had such a wonderful one at mixbook (minus a trim issue but they are sending me a free replacement so I can’t complain and next time I just won’t put any image flush with the edges of the page again). Since this books only cost $11 (24 pages) and it’s not a gift, it’s not worth another complaint to shutterfly. I will just stay away from now on. Hi, I just stumbled upon your site when looking at reviews of photobook sites. It has been so helpful!! I love how you take the time to respond to everyone! I did my first book through shutterfly and thought the pictures were grainy, and the faces were too red. (did not know about vivid pics, glad i do now) It was the 8×8 hard cover. I am wondering since you have seen so many of these which company do you think prints the clearest, least grainy?? I read most of your reviews and it is hard to tell what your favorite is. I plan to continue to do hard cover 8×8. Thanks for all your help, and hard work!!! Amazing reviews here!!! I’m glad you like my site. I haven’t given specific ratings yet as I’m still in “exploration” mode. But so far, Shutterfly, MyPublisher, MyPhotoCreations, Photobook America, AdoramaPix I think print the clearest. I usually go by who is having a sale. Have you check out the photo book deals? Since this just happened to me I thought that you and your readers might benefit from my experience with Shutterfly. I had used their services for 4-5 years making photobooks, hardcover and softcover, snapshots and cards. Generally they have done a good job. A couple months ago I ordered and received 3 hardcover photobooks. Unfortunately they had printing errors in them. Rather than re-printing them they gave me credit for the books. Also I asked for shipping credit for the books–otherwise I would have had to pay a second time for books to be shipped to me. For Shutterfly’s mistakes they were making me pay. The customer service agent saw the merit of what I said and gave me a credit for shipping. Great I thought–until I made some books a few weeks later and tried to use the shipping credit. Because I had made and ordered some cards 10 days previous the shopping cart automatically inserted the shipping credit when I purchased the cards. I made the error in assuming that Shutterfly had a promotion giving me free shipping on the cards. The result of this is that I am paying twice the shipping in order to receive good versions of my photobooks. I don’t understand Shutterfly; I was going to work on a photobook and found they changed so we are not in control of photo placement. Am I correct? I need a new company. Any suggestions? Did you click on the custom path? They are supposed to have gotten more customizable, not less. Are you working on a book you started from a while back, or are you working on a new book? Perhaps a book started in a past version of the software is not customizable anymore? I think they sent out an email to everyone telling them something like to that extent – sorry I can’t recall for sure. Make sure you’re in custom path though! 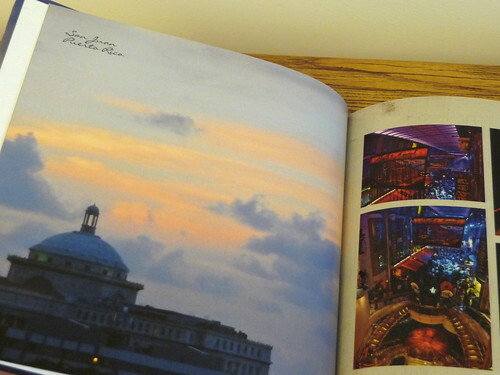 do you prefer the softcover or hardcover photobook? We’ve ordered plenty of hardcover and have always been happy – except that when the book has a large # of pages sometimes the pages tear out of the photobook (we do have small kids that contribute to this). Do you think the binding is better on the softcover or hardcover? Thanks. And have you since ordered books without the vividcolor turned on and did you prefer that to using the vividcolor? I’m torn. I’ve read some other reviews that said not using vividcolor made their photos dark. We’ve always used (b/c we didn’t know it was turned on) and have always been happy. Only noticing a few pictures here or there overly saturated/reddish. Thanks again for your input on both of these questions. Hi Claire, regarding the vivid pics, since I had an issue, I will likely opt to turn it off. But if you have always been happy with it on, then I say “if it’s not broke, don’t fix it”. 🙂 Your monitor is showing your photos to you in a certain way and if they “match” with what you’re seeing in the books, then that is how your monitor is “calibrated”. With regard to softcover versus hardcover, I prefer hardcover. Not for binding reasons, but I think they just look nicer – like a “real book”. If I order softcover it’s more for keeping costs down rather than binding issues. 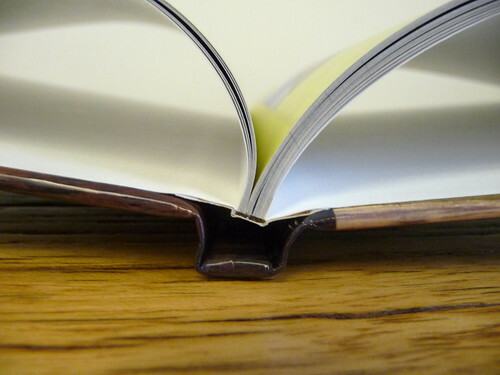 Most softcover books are perfect bound (glued). Some hardcovers are stitched as well, but I don’t believe Shutterfly’s are. I know about the issue with kids. Since Photo Book Baby is still young, I sit with him when he wants to see one of my photo books, and I don’t let him touch the more expensive ones. (He’s an incessant drooler!) I have thought about ordering second copies of my books of him (when they go on sale) as one day I’d like to give them to him (yet keep one for myself). I make a lot of photobooks and appreciate your tips. However, I also make cards from prints and lately noticed that Shutterfly shorts the 4X6 prints. Customer Service acknowledges their 4X6 prints are actually 4×5&7/8, but I have also received ones that are 3&7/8 X 5 & 7/8. Bummer! My cards are set up for a true 4X6. I have ordered many books from Shutterfly. I love them all. Some photos were lighter than what I thought they’d be but overall still great books.